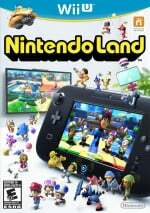 Nintendo Land combines several key Nintendo franchises — Zelda, Animal Crossing and more — into a theme park-style minigame compilation. Each title has its own new graphical style, and the super-cutesy hand-stitched Zelda game certainly tickles our fancy. The Legend of Zelda: Battle Quest game features archery and swordplay in a cloth style. The player with the GamePad fires arrows while the other players use Wii Remote Plus controllers — we're imagining Legend of Zelda: Skyward Sword-style controls — and must co-operate to take down enemies. It's not quite Four Swords Adventures 2, but it'll do. Donkey Kong's Crash Course: Using the GamePad's motion control, players tilt the controller to guide a fragile rolling cart through an obstacle course that resembles the original Donkey Kong arcade game. This single-player game lets other spectators watch the action on the TV and offer advice about how to pass the next obstacle. Luigi's Ghost Mansion: The player with the GamePad is a ghost (invisible to others) who is trying to capture up to four humans armed with flashlights. The ghost must sneak around the environment by staying in the shadows and try to catch them one by one. The humans can work together to revive fallen comrades before the ghost catches everyone. If all four humans are caught before they are revived, the ghost wins. But if they are successful at shining their flashlights on the ghost long enough to reduce its hit points to zero, the humans win. Takamaru's Ninja Castle: Based on an early Famicom game available only in Japan, this single-player game turns the GamePad into a launcher for ninja stars. Players swipe the controller's touch screen to take out an ever-growing army of ninja attackers, earning more points for consecutive hits. Moving the GamePad around at different angles enables the player to take aim in an intuitive fashion. A port of Gamecube Four Swords Adventures would have been preferable. This looks awesome!Hopefully this title will be also on the 3DS. "This single-player game lets other spectators watch the action on the TV and offer advice about how to pass the next obstacle." I don't think the cloth style really works for the Zelda series. @Irken004: Thats what I was thinking. I'm really coming around to this — it seems pretty rad and I'm happy it's not just another sports compilation. I'll only get it if it's bundled free with the console and I'm not forced to play it. It's an awesome game concept but should also be for the 3DS. Thank you Nintendo for not forgetting to include your Japanese-only franchises in your major releases, just like with Smash Brothers. The single player action is on the Game Pad while the spectators can view it on the TV and offer advice. 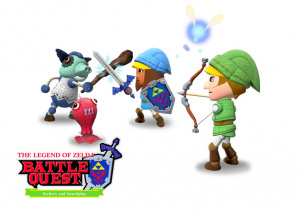 i'd love to see battle mii and catch mii from last year's E3 in this game. battle mii would be renamed metroid melee and the toads-based catch me game, catch mii toads or something like that! I like the yellow peaks on the Link caps.